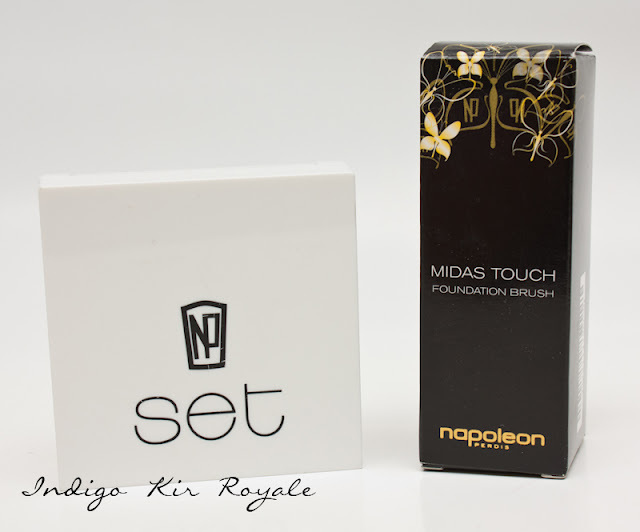 The Napoleon Perdis Midas Touch Foundation Brush. 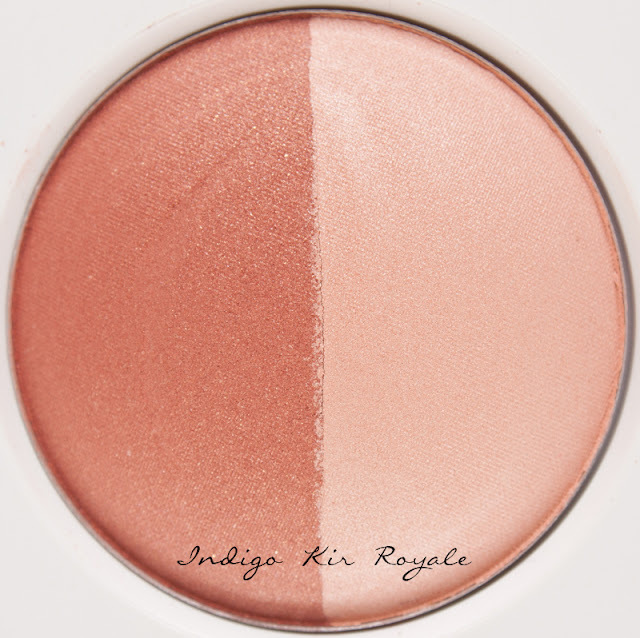 This is a duo powder compact consisting of a blush and highlighting powder, which you can use individually or mix together to give a glowing colour to your cheeks. 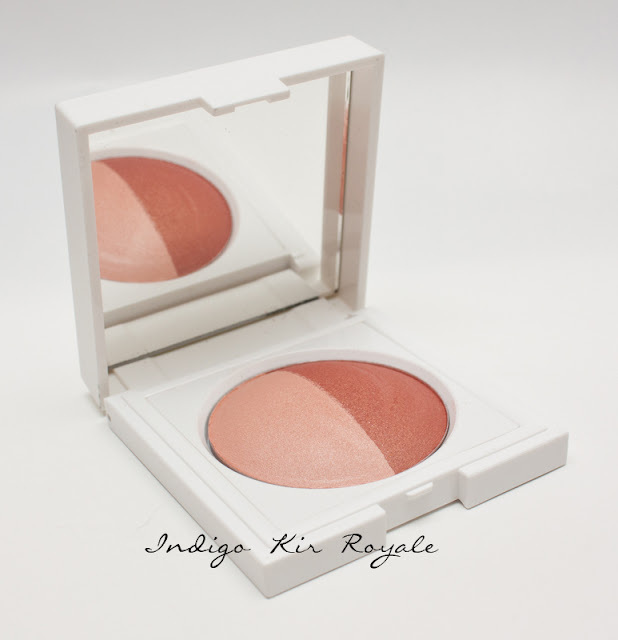 The colour is a pale peach highlighter and a deep coral/peach blush with very subtle gold shimmers. 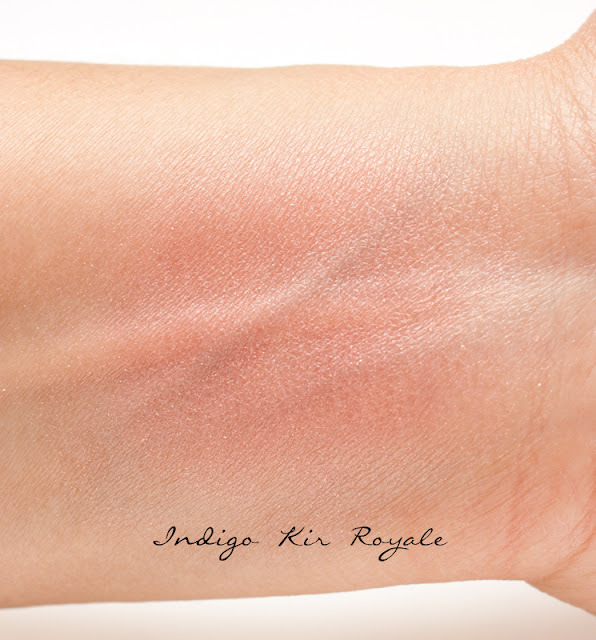 When applied against my olive skin tone, the blush even appears to have an ever so slight rose hue – I could probably get away with using it as a bronzer as well! It gives the skin a subtle glow. It has a baked powder formulation which can be applied dry or wet. 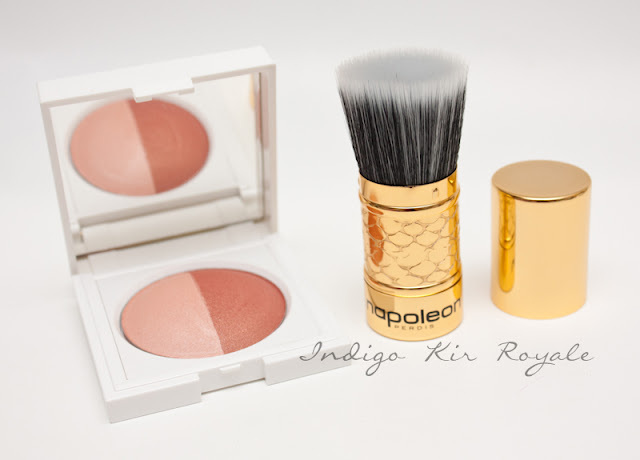 Unlike other ‘baked’ powders I’ve tried such as Chanel’s, this one is actually a bit softer in comparison and it is easy for the brush to pick up the product (even the softest brush). 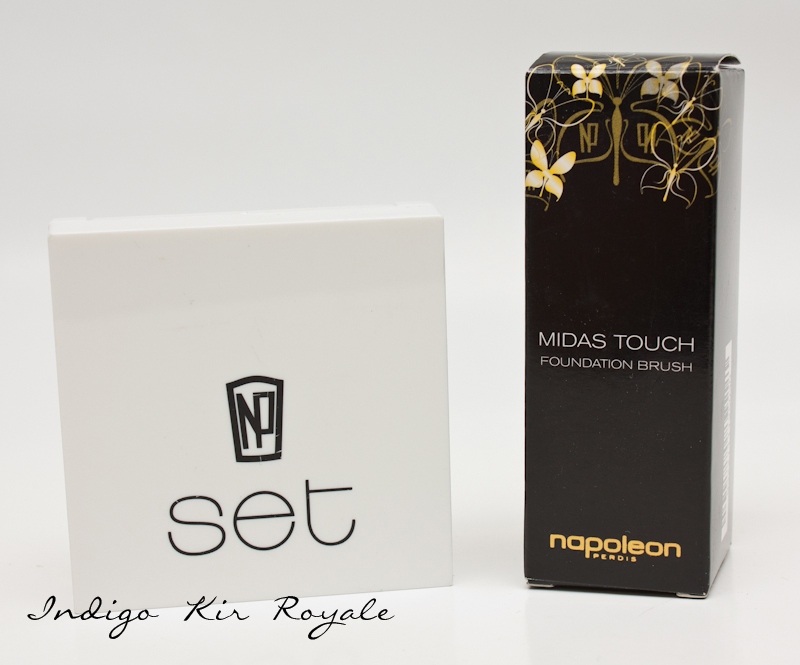 Soft powder texture that blends smoothly on the skin. The domed shaped powder typical of baked formulations. 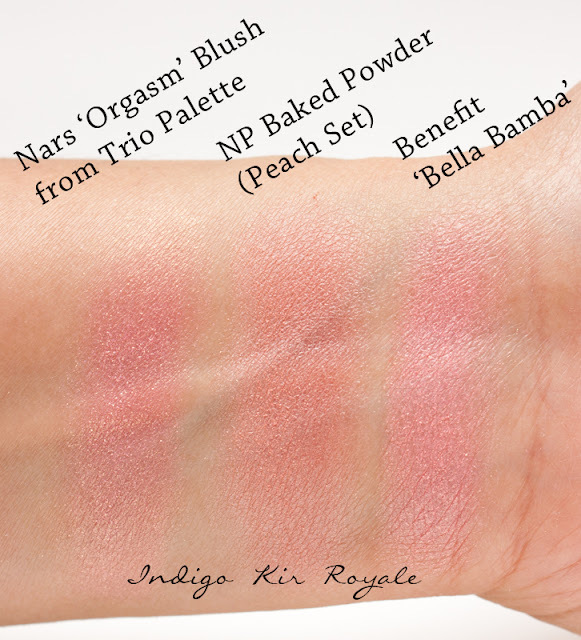 Left half of the baked powder contains the blush (it looks dark and a brown bronze in the pan, but actually appears brighter on the skin). 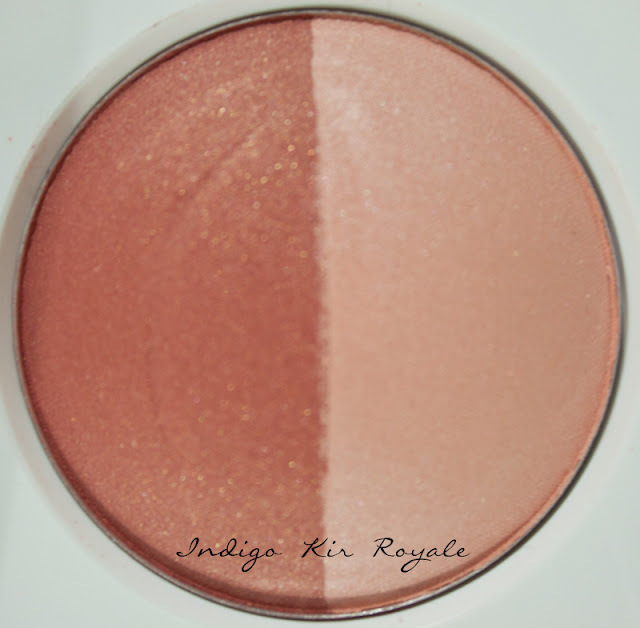 The right-hand side contains the pale peach highlighter. Photo to show the subtle gold shimmers. Against medium-to-light tan olive skin tone (~NC30). Photographs were taken indoors using a strobe. 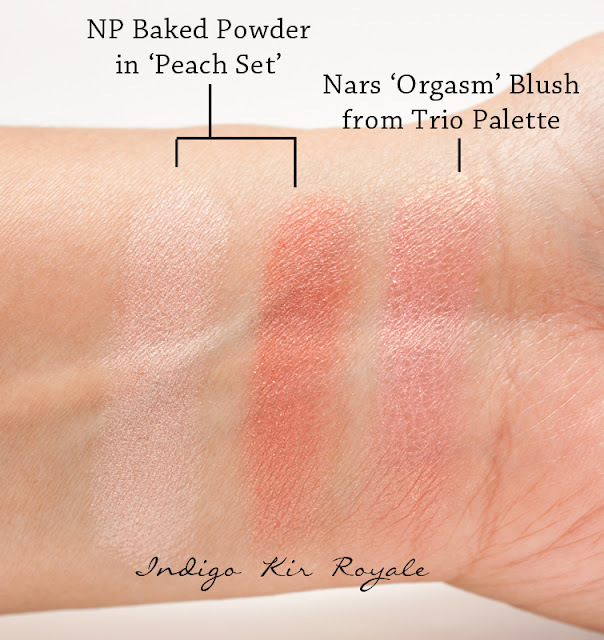 L – R: Highlighter and Blush. 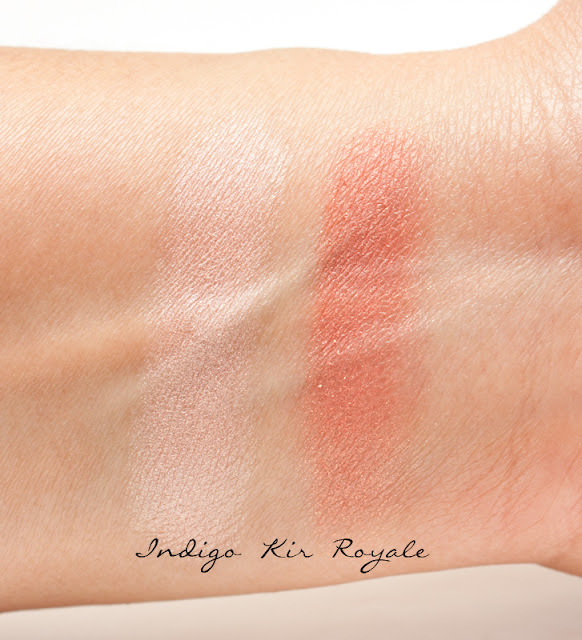 Swatch of both blush and highlighter mixed and blended together. Safflower & Sunflower Oil (these are apparently the moisturising and softening properties of the product and is non-comedogenic (i.e. will not clog pores). Paraben Free so great for sensitive skins. 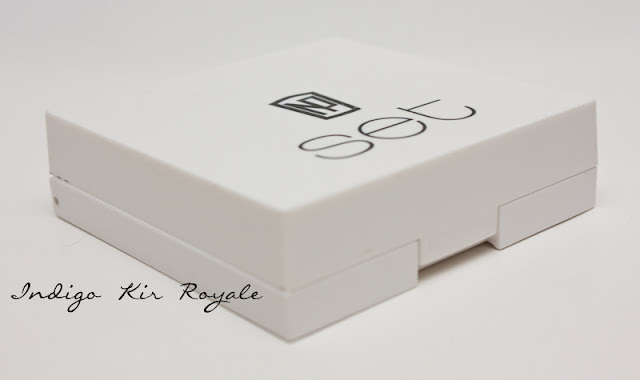 The duo powder comes packaged in a square, white plastic compact and has a handy mirror for on-the-go application and touch-ups. Product description label at the bottom of the compact. A generous amount of product: 17 g / 0.60 oz. 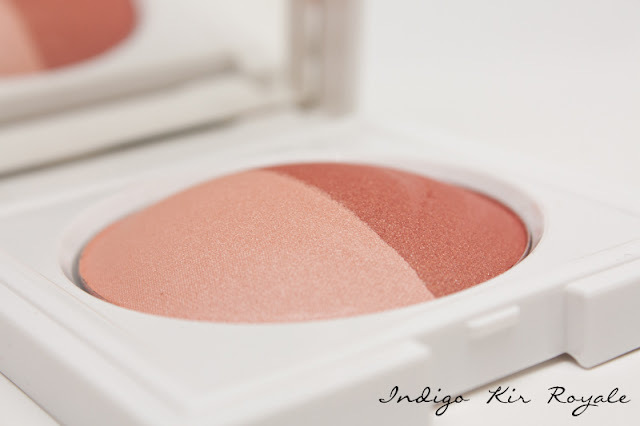 There is a fairly strong scent in the pan and during initial application to the cheeks. It’s not particularly appealing as it reminds me of the scent of band aids! However, thankfully, I can’t really notice the scent anymore soon after application. 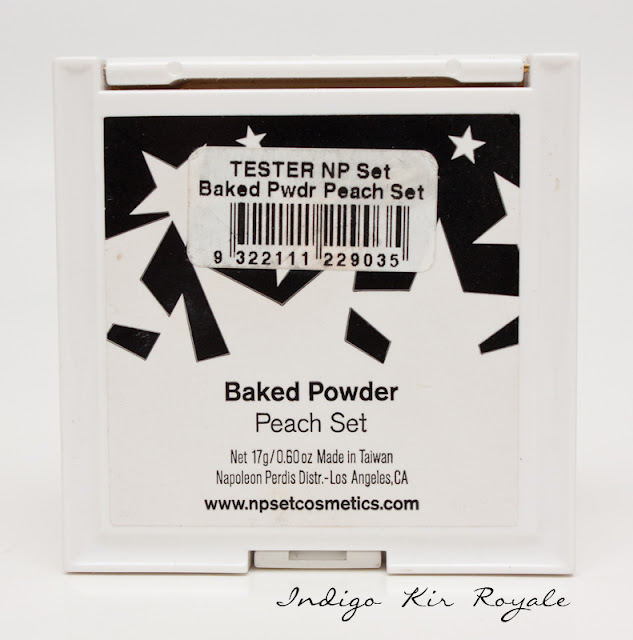 For Aussies, you can find the NP Set Baked Powder online on ry.com.au (currently on special for AU$27.60). [Prices as of June 15, 2012]. 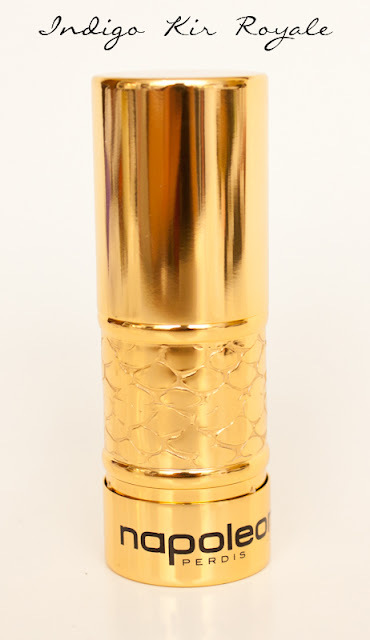 This is a stippling brush that comes in a retractable, embellished gold case which makes it perfect for keeping in the hand-bag or travelling with. Very convenient to use due to it’s compact size and keeping the brush protected from other items. 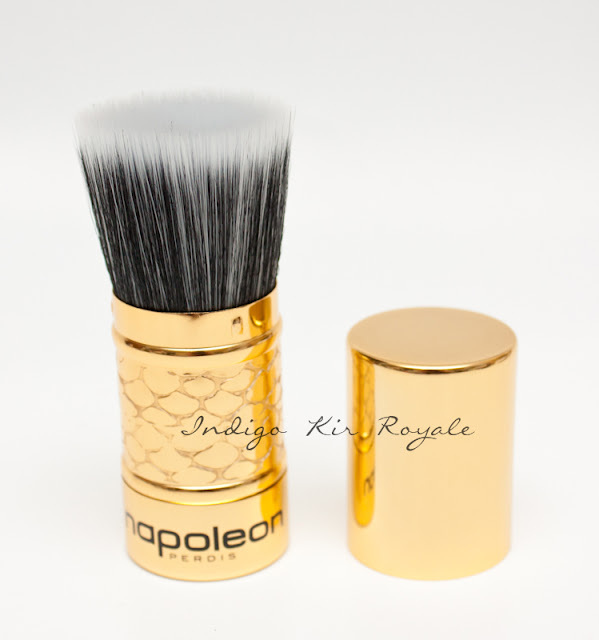 The brush can be used for applying powder, foundation, bronzer and blush. 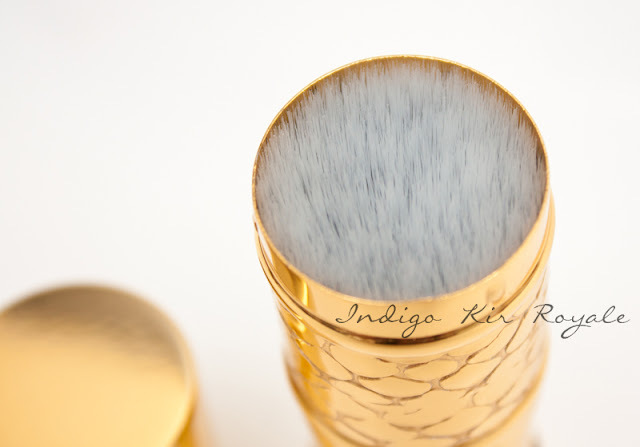 It’s a great all-rounder face brush that leaves a flawless, “air-brushed” finish without the risk of ever applying too much. 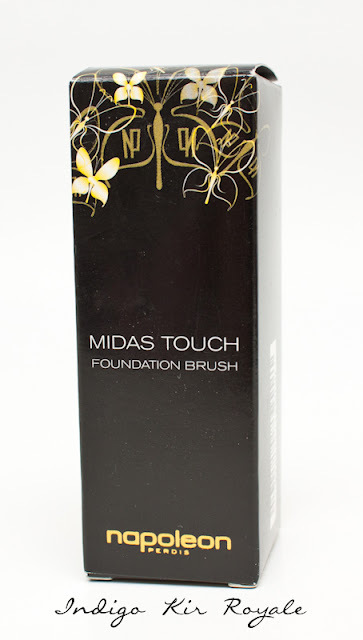 The synthetic tips of the brush means it doesn’t absorb any product so it avoids wastage. The brush is a combination of natural (the black bristles) and synthetic bristles (the white tips). The case when extended fully. Brush end. It has a round shape and a flat end. 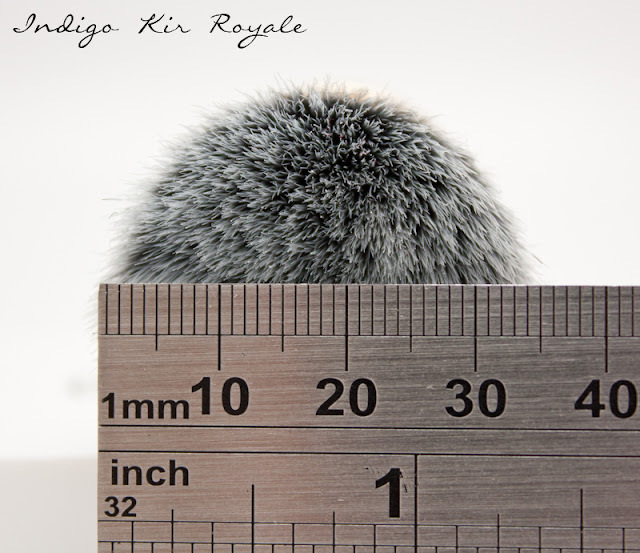 The brush is approximately 3.5 cm in diameter – a fairly large brush. 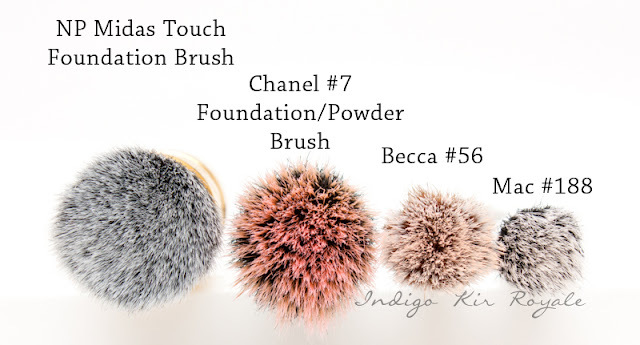 Brush size comparison with other stippling brushes I have – please excuse a couple of brushes which have yet to be washed! 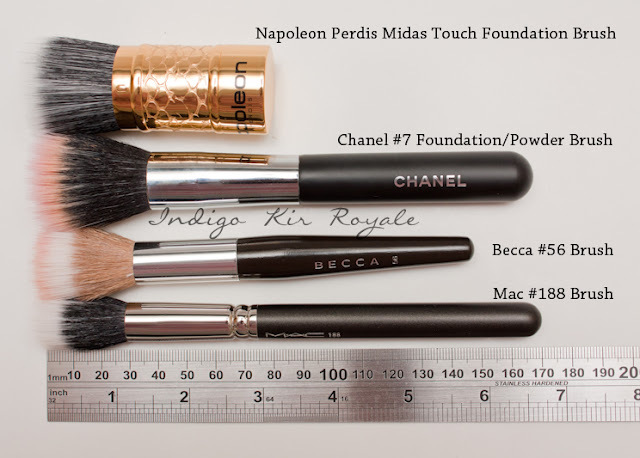 (L – R): NP Midas Touch Foundation Brush, Chanel #7 Foundation/Powder Brush, Becca #56 and Mac #188 Brush. As you can see from the comparison above, the NP brush is the largest and is the most dense stippling brush, so it gives good coverage and is great for buffing the product onto the skin. The other noticeable difference is that it feels just a little bit harsher on the skin when you stipple (dab product onto the skin) and I think it’s because the ends of the synthetic bristles are not as fine as the other three brushes. However, I think it’s still a decent brush to use. I like the large size and density of it so it’s quicker to apply and buff product to the skin. Brush length comparison (top – bottom): NP brush (about 8 cm in length), Chanel #7, Becca #56 and Mac #188. I think this brush is pretty good. 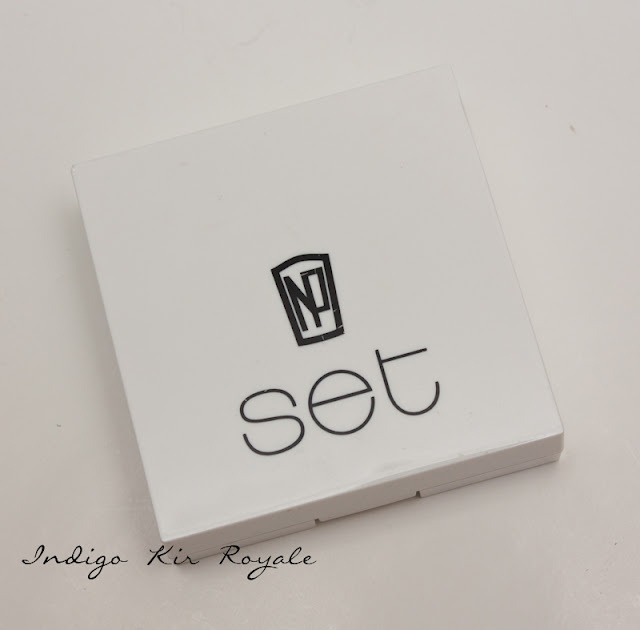 I love the fact that it comes in a retractable case so I can use it on-the-go and not ruin the brush bristles and not leave a mess in my hand-bag. I really like the large size and density of the brush. It feels fairly firm when buffing and gives excellent coverage. Apart from the tips not being as soft on the skin as the others, I would still definitely use this because of the reasons stated above. Unfortunately, for some reason I can’t find this brush when googling online. 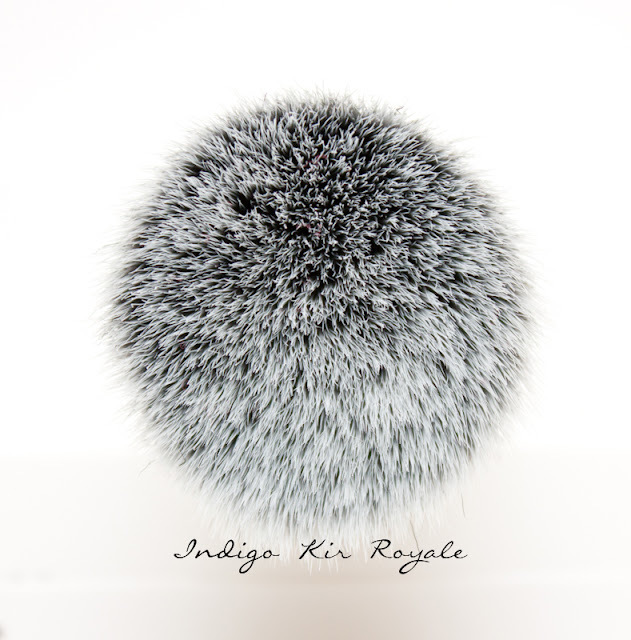 If you’re interested in this brush I would enquire online on ry.com.au. Otherwise, if you have information regarding its availability and price, please leave a comment below – it’s much appreciated! 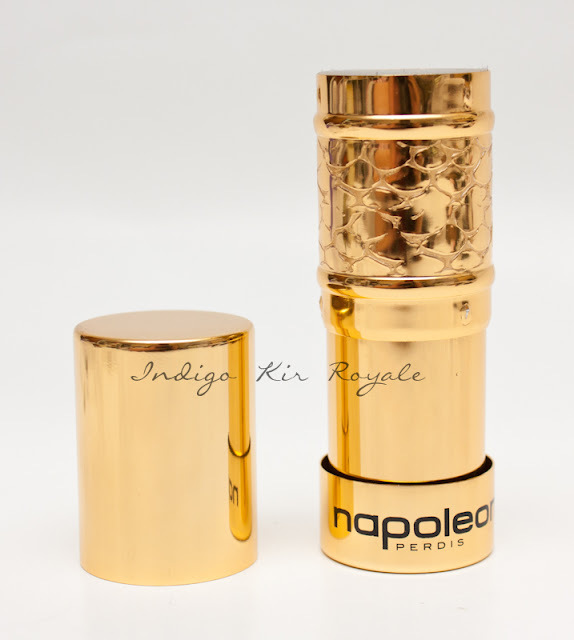 I’m left with a good first impression of Napoleon Perdis. 🙂 I found the products are pretty good value for money considering the quality is descent (I found no real issues in them), and the fairly generous amount of product provided, and it’s affordable. I’d recommend you try this brand out if you haven’t already!